So this was a slow couple of weeks for me. I was out of the country on vacation for most of that period, so I was trying not to do much trading. Also, I don't like to do a whole lot in the heart of earnings season, because the market can often become choppy from one day to the next based on how the reports are each day. 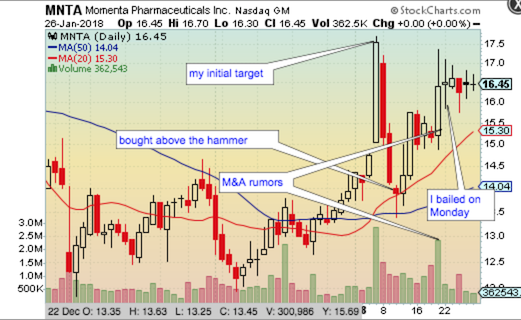 First an update on the positions (CENX & MNTA) I mentioned in the previous Trades of the Week. I tried to let CENX run but it seemed like every day it was getting hit with a downgrade. It gapped down twice and recovered, only to stall at what was my initial target. I was tired of the chop and decided to just take the money and run. 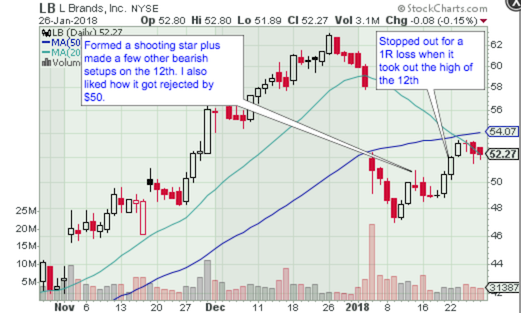 I ended up making $1.90 per share, or just under 2 times my initial risk (+2R). This one didn't quite reach my intiial target. A few days after I bought it there were rumors swirling about the company looking for M&A opportunities. I thought that might have lit more of a fire under it but it couldn't even retest the January high. I decided to hold it over the weekend to see if they might announce a deal on Monday. They didn't, so I decided to cut & run. I netted about $2.10 per share on this trade, which is about 2.4R. 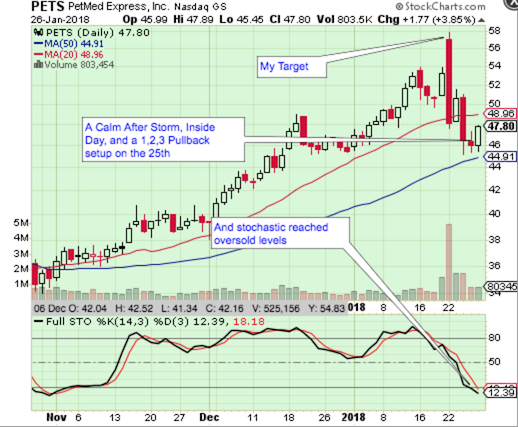 I entered a short in LB on January 16th basaed off of some bearish signals on the previous trading day. This one worked for a couple of days but then it reversed and stopped me out for a 1R loss. This one wasn't really based on any signals that SwingTradeBot gave me. I keep NVDA on my watchlists (on SwingTradeBot, and in my broker's platform). 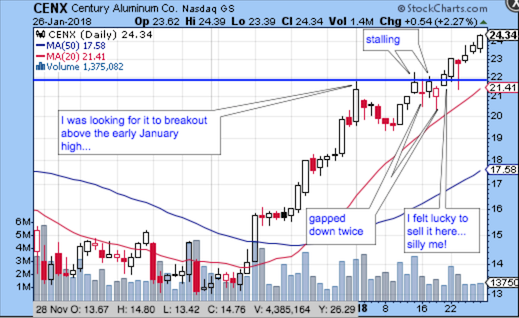 When I saw it gapping up to a new all-time high I felt like I had to take a swing at it. If you've been reading my posts for a while, you'll know I don't like chasing breakouts. 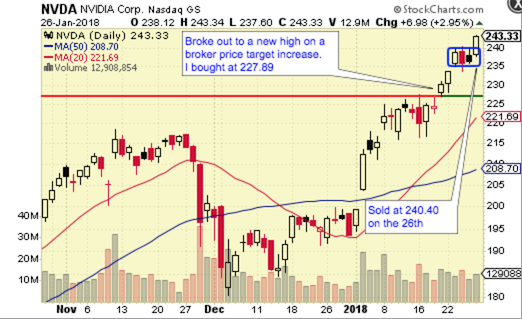 But given how strong the market's been and because it was still pretty close to the old high, which should be turning from resistance to support, I decided to give it a shot. I used a 1 ATR (Average True Range), which is approximately 6 points, as my stop loss and sized my position accordingly. I bailed out of NVDA on the 26th with a 2R gain. 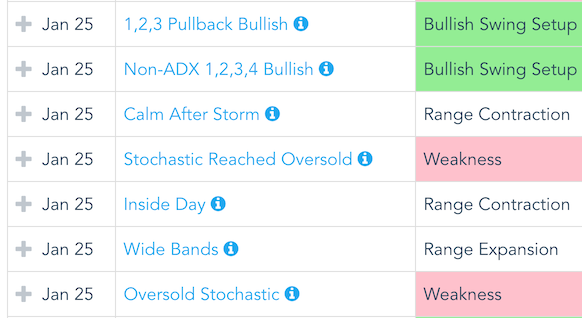 This is another one of those situations I created the "Calm After Storm" scan for -- a stock which had a big, positive earnings reaction and then pulled back. I'm still in PETS, with my stop just under the lows of Wednesday & Thursday.